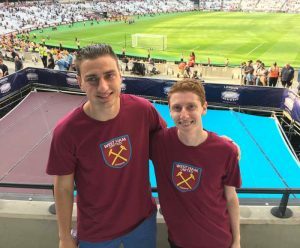 Students Justin Perline ’19 and Charles “CB” Garrett ’19 in Falk College’s sport analytics program attended the European Sports Economics Association (ESEA) Conference in Liverpool, England, from August 29-31, 2018. ESEA is the premier sports economics conference held annually in Europe where sports economists present on a variety of theoretical and empirical models related to the economics of sports. Their paper, “Minor League Team Success and Its Impact on MLB Player Performance,” with sport management professor Rodney Paul as a co-author, is an academic treatment of the research by Perline and Garrett that was featured in Baseball America, a top website in the world of baseball. Their research investigates positive externalities from minor league team success as it relates to marginal revenue product of a baseball player, measured by WAR (Wins Above Replacement). The results illustrate that winning has a positive impact on individual performance later in a player’s career and has economic implications for baseball teams and for the workplace in general. Perline is a dual major in sport analytics and in newspaper and online journalism. Garrett is a dual major in sport analytics and broadcast and digital journalism. “It was a great experience to get exposure for our research in front of international industry professionals,” Garrett said. “The other presentations helped enhance our knowledge of the field and will be put to use in our upcoming thesis. Also, it was awesome to explore England. We want to thank Mr. Berlin for his donation to help pay for the trip.” Earlier this year, a $1 million gift was made by Syracuse University Trustee and alumnus, Andrew T. Berlin ’83, partner owner of the world champion Chicago Cubs and its minor league affiliate, the South Bend Cubs, to benefit student-focused initiatives in Falk College’s sport analytics program. Paul also presented “The Role of Uncertainty of Outcome and Team Success on Attendance Outside the NHL: Comparing the top Leagues in Europe to the Minor Leagues in North America” at the ESEA conference.